Voters go to the polls on May 25th to decide what to do with the Tempelhof Field, site of the Berlin Airlift. Developers and city officials claim that Tempelhof needs to be developed because of the need for housing in the city. Last year alone, 50,000 people moved to Berlin and another quarter million are expected to arrive by 2030. With Tempelhof’s location within the city and its considerable size, it is a prime spot to address this housing crises. Berlin’s City Development minister, Michael Müller, explains, “we need to build and to build here because it is exactly here that we need affordable housing”. As much as half of the homes set to be built in Tempelhof would be affordable, according to city spokesman. Martin Pallgen. Opponents to development and supporters of the “100% Tempelhofer Field” referendum, don’t see Tempelhof field as the answer to the housing shortage. Margarete Heitmuller, on of the referendums initiators, voices, “as Berlin is getting more and more densely build up, we desperately need green spaces like (Tempelhof)”. The park, which is larger than Central Park, also draws a lot of comparisons to its New York relative. Christoph Breit, who helped gather signatures for the referendum asks, “would anyone try and transform central park into a housing complex”? For the residents of Neukölln and Kreuzberg, the borough neighboring the giant park, there are better place to build than their beloved Tempelhof. 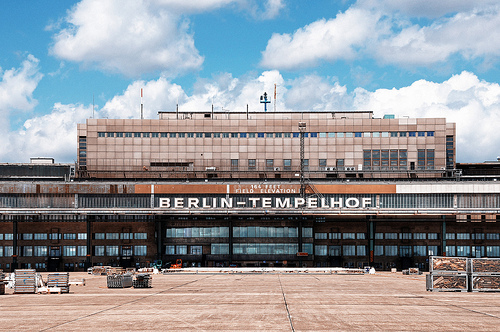 The referendum to keep Tempelhof from being developed, “100% Tempelhofer Field”, received 185,328 valid signatures, enough to make it an issues that requires a vote. This petition received support from roughly 7% of the city population while it will need 25% of the electorate to vote. Voter will be able to cast their opinion on May 25th, the same date as the European Parliament elections. Holding the referendum the same day as the European Parliament elections will hopefully increase notoriously low voter turn out for the issue. It is now up to German voters whether or not to use Tempelhof as a new site for affordable housing or keep it as the funky park it is today.